A woman scours a war-ravaged battlefield, stripping dead soldiers of their boots and wares — anything that she can sell. She pushes her cart through a ransacked village, refusing to give her linen to bandage the wounded. She would rather see these people die than lose a chance to profit, because after all, war is just a business. 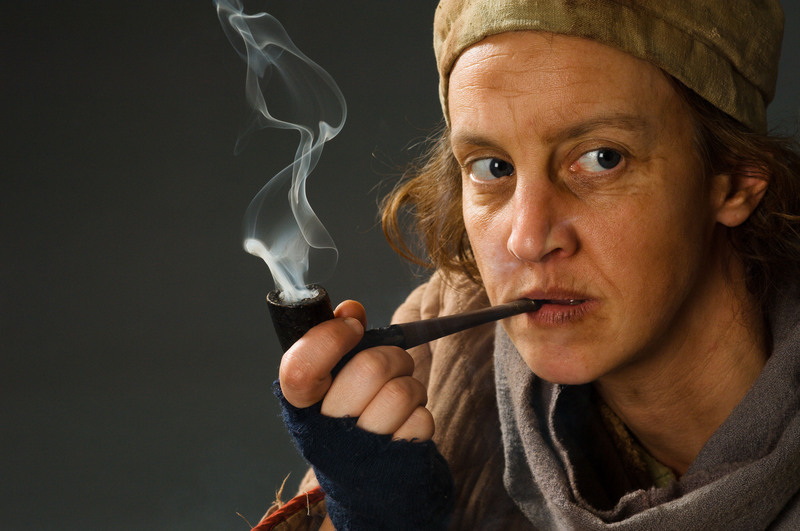 This is Anna Fierling, the leading character in Bertolt Brecht’s “Mother Courage and Her Children,” the next live theatre production at UBC running March 7 – 17 at the Frederic Wood Theatre. Fierling — nicknamed “Mother Courage” — is a wily canteen woman with the Swedish Army who is determined to make her living from the war. She justifies her ruthlessness with the need to protect and feed her children. The eventual and brutal deaths of each of her three children — Swiss Cheese, Eilif, and Katrin — shows that no one profits and that war costs everything. Director Camyar Chai (BFA Acting ’93), co-founder of Vancouver’s NeWorld Theatre, heads the production with new music by multi-award winning composer Patrick Pennefather, an 18-member cast, and what he calls a very compelling topic. “I think Brecht’s point is that it doesn’t matter what you think your reasons are for war; it doesn’t matter whether you’re right, or you’re wrong; it doesn’t matter whether you’re good or evil. War in itself is an evil construct and no one is going to profit from it; no one is going to win from it,” Chai explains. Brecht gets his message across through the character of Mother Courage, who Chai says is far from being black and white. “Everything she does, though seemingly ruthless, from her point of view is in defense of her children,” notes Chai, a Master of Fine Arts (MFA) candidate who is directing the play as his thesis project. The cast includes intermediate and final year actors in the Bachelor of Fine Arts (BFA) acting program, as well as Anderson’s 10-year-old daughter, Anoushka, who plays Katrin, Mother Courage’s dumb daughter. Chai believes in projects with a socially conscious perspective. “When I’m actually involved in producing, or choosing plays to direct, or write, or act in for my company, it’s very important for me that they have immediate relevance to issues that I believe in,” says Chai, whose current NeWorld production, “Adrift on the Nile,” encourages audiences to bring in and recycle their old cell phones. “Some of the prosperity and comfort that we have as Canadians and North Americans is a result of a lot of suffering in a lot of other countries, be it in terms of oil revenue or be it in terms of arms sales” he adds. In light of current debates on Canadian involvement in Afghanistan, Iraq, and Darfur, the play makes a timely debut on the UBC stage, notes Chai. Although it is very dramatic, Brecht also has a sense of humour, Chai adds. Chai hopes that the play will spark conversation and challenge audiences about their own perceptions and relationships to war.